We’ve all seen it: a mother touching the forehead of a child thought to be ill. That simple act ruling out fever is the first line of diagnosis and treatment. You can do the equivalent – and more – for a control cabinet. The key is to properly understand and use a thermostat. By both sensing temperature and taking steps to control it, a thermostat can help ensure the health of equipment. This is becoming more important as electronics becomes more concentrated within an enclosure, which means more power is consumed and more heat must be dissipated. The increasing use of computers is a particular problem because they tend to generate a lot of heat but may not be the most sensitive of electronics gear to the temperature rise that results. Thermostats come in two basic varieties: mechanical and electronic. Mechanical thermostats are simple devices, sensing temperature through the movement of a bimetallic contact. They’re energy efficient and small. But, they have problems: accuracy and hysteresis or lag. The first means that measurements are only good to about 4o C. The second means that the thermostat is always running behind, perhaps by as 4o C. So the temperature will oscillate, successively over- and undershooting a set point. Now, panel builders and installers can minimize such problems. Doing that, though, means constant adjustment of the mechanical thermostat. 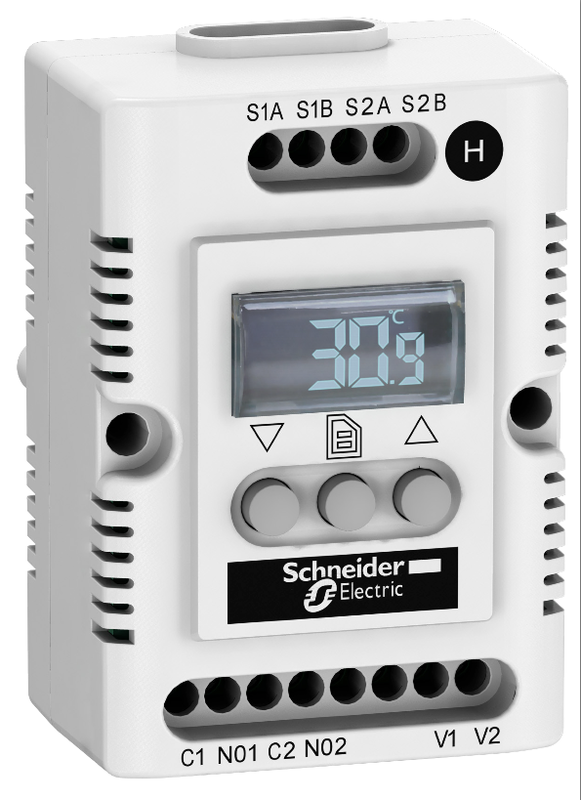 Electronic thermostats are more complex but are also more accurate, typically sensing the temperature to within 1.5o C. Importantly, their hysteresis is smaller and is often adjustable. This means more precise temperature control, which is important for the equipment in a control cabinet. It also can be beneficial for the temperature control equipment itself. For instance, better control can mean an air conditioner runs less, reducing mechanical wear and extending the life of its compressor. Also, electronic thermostats offer greater capabilities. They can have multiple relays, combining simple ventilation, heating, and more in a single control. They can also collect important and useful data, such as kilowatts consumed or average temperature. That information can be critical when it comes to optimizing heating equipment or figuring out what is happening on weekends when no one is around. Finally, the greater accuracy may be important to ensuring the operation of particularly sensitive equipment. It also can prevent some very big problems. Say, for instance, that there is a metal surface and water can condense on it and potentially cause shorts. We can stop that by turning on a heating element, but too much heat can cause its own problems. So a more accurate temperature measurement minimizes the condensation problem without hurting sensitive equipment. Both mechanical and electronic thermostats come in various form factors and DIN mounting options. By making the right choice for your control enclosure, you can make assembly quick and efficient. Speaking of assembly and choices, there are two things to keep in mind. The first is that heat rises. So, a thermostat should be placed inside the upper part of an enclosure. That’s the point where the temperature will be highest. Following the same logic, if measuring humidity is important, do that at the bottom of the cabinet. The second point to keep in mind is that you should think inside the box – or enclosure. Too often the question of cost is considered separately for each piece of equipment. If instead you think about the value and function of what is inside a cabinet, you may come to a different conclusion about which thermostat technology is best for your situation. Finally, no matter the choice, you’ll find that thermostats are better than a mother’s touch or the roses that supposedly warn growers of diseases in grape vines. That’s because thermostats can both detect a problem and can also provide a fix. Click here to learn more about ClimaSys CC-Thermal control offer.